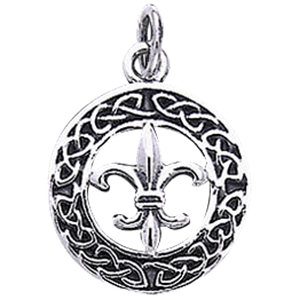 We offer a wide selection of Celtic and Scottish jewelry for reenactment ensembles and daily wearing. 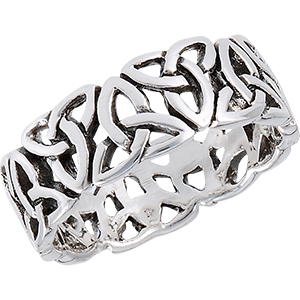 Our Celtic jewelry is made from fine materials like white bronze, pewter, and sterling silver that has often been decorated with shimmering crystals, enamel, or other ornamentation. 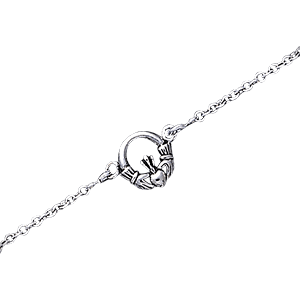 In addition to traditional pieces like Claddagh rings and triquetra pendants, we carry gorgeous Celtic anklets, Celtic bracelets, Celtic brooches, Celtic earrings, and Celtic necklaces that show off triskeles, shamrocks, the Greenman, Celtic crosses, the tree of life, and other iconic motifs. Additionally, various pieces combine knotwork patterns with animals important during ancient times like boars, butterflies, dragons, cats, hares, dragonflies, horses, and ravens. These pieces of gorgeous knotwork jewelry work great as gifts and come in a range of affordable prices. 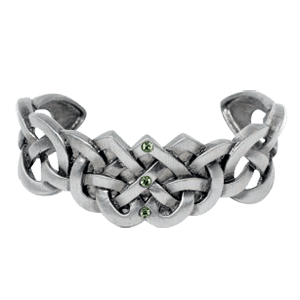 We are pleased to offer an excellent range of Celtic jewelry, including these beautiful Celtic bracelets. We carry Celtic torc bracelets, Celtic link bracelets, Celtic cuff bracelets, Celtic bangles, and Celtic leather cuffs for men and women to enjoy with their reenactment apparel or on a daily basis. Crafted from fine materials like pewter, white bronze, sterling silver, brass, and copper, many of these pieces are decorated with colorful crystals and antiqued finishes. These Celtic accessories display triquetras, triskeles, Celtic crosses, Scottish thistles, shamrocks, Claddagh designs, the Greenman, and other iconic motifs. Our knotwork bracelets make great gifts or personal accessories. Whether you want a decorative pin or a device to fasten a cloak or cape, you can find excellent options here among our Celtic brooches. These Celtic pins are the perfect way to show your heritage or your appreciation of traditional Celtic styles. Our elegant endless knotwork brooches are made from materials like fine pewter, white bronze, and sterling silver, and several are decorated with colorful gemstones. 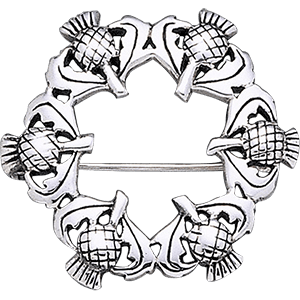 We carry Scottish brooches that display thistles and shamrocks, as well as classic Celtic cloak pins featuring Claddagh hands, triquetras, the Greenman, and other iconic motifs. Check back regularly to see the latest additions to this growing category. Our Celtic earrings will make the perfect accent to any outfit, whether you are dressed for everyday or a Renaissance fair. 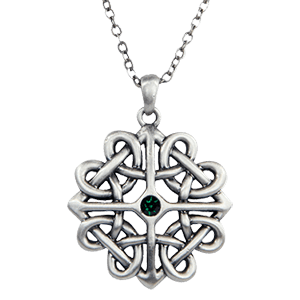 Our gorgeous Celtic jewelry is an excellent way to show pride in your heritage or your appreciation of traditional Celtic designs. Many of these Celtic hook earrings and Celtic post earrings are crafted from fine pewter, white bronze, brass, copper, or sterling silver metals, and a number are decorated with colorful crystals. The majority of the knotwork earrings we carry do require pierced ears in order to wear them. Our inventory contains a wide variety of styles. 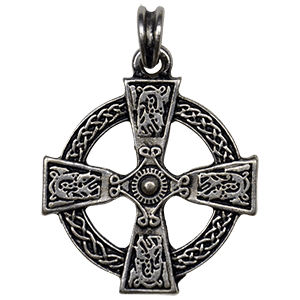 We carry Celtic cross earrings, Claddagh earrings, triquetra earrings, triskele earrings, Celtic heart earrings, Greenman earrings, tree of life earrings, shamrock earrings, Celtic moon earrings, Scottish thistle earrings, and many more beautiful designs. 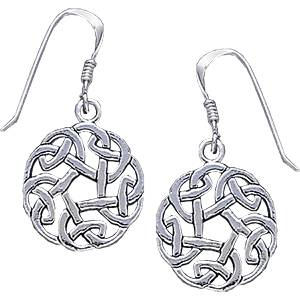 These Celtic knot earrings pair extremely well with our other Celtic jewelry and work great as gifts.